What does success look like? How do you know that you have arrived? For some, success is quantified by wealth, status and luxury. They relish the idea of being comfortably ensconced in the top rungs of the social and corporate ladder. Here, success is measured by distinctions, degrees, bank accounts, job titles, and material possessions. While there isn’t anything wrong in ambition, one must be careful not to be enveloped by the mindless pursuit of “mammon”. According to the Merriam-Webster Dictionary, the word represents “material wealth or possessions, especially (those) having a debasing influence”. Surrounded by the trappings of luxury, a person who worships mammon may be lulled into a comfortable slumber. Cushioned from the rigours of this world, he may lose touch with his humanity and spirituality. Does this mean that it is wrong to be rich? Certainly not. Rather, the danger lies in loving material success so much so that you sacrifice your greater calling. Which brings us to the second view of success epitomised by the mammoth – a huge furry prehistoric ice-aged beast. A mammoth task is one that requires herculean feats to accomplish, and is not for the faint-hearted. It is a worthy pursuit that makes a significant difference in one’s lives and the lives of others (think about what one dead mammoth can yield to a tribe of cold and hungry prehistoric cavemen!). 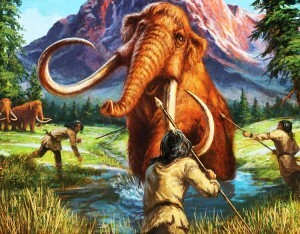 A mammoth is a project that yields much good for the community. It is something that can be shared amongst members of the tribe and which goes beyond selfish individual gain. However, a mammoth can be an outsized challenge that can only be surmounted with considerable planning, skill and perseverance. Subduing a mammoth often requires sacrifice. While one may be stimulated by the hormonal rush of adventure, success often comes at a price. The question we should ask ourselves is this. Are we prepare to forgo the comforts and luxuries of our lives to pursue that Big Hairy Audacious Goal (BHAG)? For sure, risk is a big part of riding the mammoth. You need to have the guts to stare down your adversary straight in the eye, grab it by the tusks, and tie it down. You also need to leave the comforts of your cave and your tribe, weather unbearable cold, and traverse untold miles before meeting your quarry. While embracing uncertainty, leveraging fear and plunging into uncharted icy plains doesn’t necessarily make you a pauper, it does require you to put something on the table. You need to put up with weeks, months or even years of not knowing where your next pay check may come from. If you do plan sufficiently with enough reserves to tide you over, however, such fears can be mitigated. Keep your lifestyle minimalistic and slow down your burn rate. Forecast what you need for your adventure, ensure that your basic needs can be met, and then go ahead to pursue your heart’s desire. In being too concerned about preserving our comfortable status quo, we may pierce ourselves with a million arrows. A little piece of ourselves die each time as our hearts grow colder and more unfeeling. If we feel that way, the time may perhaps be ripe for us to consider leaving the warmth of our present lifestyles, and to pursue that noteworthy undertaking of epic proportions.